Even the big name companies have jumped into the texture fray providing a dizzying array of natural curl and texture products to select from. 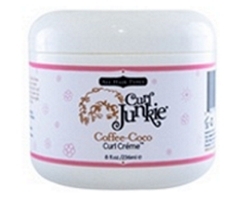 One company which always caught my eye was Curl Junkie (known simply as CJ to fans ad users). The founder when to cosmetology school like I did and created her own line. Similar to my own creation of the HairTopia vitamins and hair oils. I decided to check out the products and loved the names of the formulas even before I tried them. If you’ve never heard of Curl Junkie hair care products never fear. The line is becoming more mainstream, but ultimately it started as a product line which was mostly known amongst the natural curl community. I tried the original Coffee Coco Curl Cream, but was intrigued with the new lite version since my own hair is currently more wavy then curly. This relatively new product is described as the light version of Curl Junkie’s original formula. It is recommended for natural wavy-curly tresses and can be used on wet or dry hair. Although the formula was originally created for wet hair, as the product has found a following in the wavy/curly world, it has been found to be as beneficial on both wet and dry hair. Natural waves tend to be dry like natural curls. Even more so, when hair is highlighted (like mine), low lighted or colored. Coffee Coco-Cream Lite, when it’s compatible with the hair type and texture (it doesn’t work for all but for many), can add sheen, moisture, definition and bounce to tresses. The product is presented as being good for 2a-3c (my hair type) waves/curls. It is recommended as both a good leave-in on newly cleansed hair and as a frizz fighter on dry textured tresses. I personally liked it best as a leave-in conditioner. I found it very conditioning and moisturizing which I am really needing at this point due to recent dietary changes rendering my hair drier. I did not like it as much on my dry hair because my hair always feels a little greasy when I apply a moisturizing product other than jojoba oil or similar. I could definitely see that the product would work great for 3c-4a types on dry curls. I could definitely see it plumping up and reviving curls and coils. 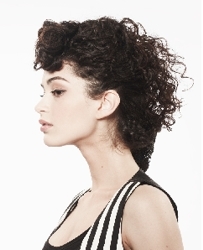 On the other hand, it just may be too light to use on tightly curl or coiled wet hair. I think like all hair products, you have to test it on your hair to evaluate the value. Of course there is no “Holy Grail” hair product for any type, texture, length or condition of hair. Every head of hair is different and needs to experiment to find the best products for them. Kudos to Curl Junkie for constantly inventing new and improved products for the textured hair world. I can’t wait to try some of their other products on my moisture challenged strands. Even better? The products is made with 96% Natural/Naturally derived ingredients and includes Authentic Monoi Coconut oil, Coffee Bean & Mango butters. This entry was posted on Friday, April 23rd, 2010 at 11:55 pm	and is filed under Beauty Beat, Hair, Hair Product Reviews, Hair Recipes, Long Hair, Naturally Curly, Treatments, What I Learned in Beauty School. You can follow any responses to this entry through the RSS 2.0 feed. Both comments and pings are currently closed.